It’s a sunny Sunday morning. You feel rested and you’d love to go on a daytrip. But you dread the drive! You know that in less than an hour you’ll feel exhausted, with a headache, and tension around the eyes. Like on many occasions in the past the fatigue will remain your companion all day! But what causes tiredness when driving (or just riding in a car)? Why driver fatigue and eye strain from driving? Think about it: unless traffic is nerve-wrecking you just sit and watch!? Curiously for some people driving is resting?!? This post draws from vision science to suggest that your driving fatigue (and glare sensitivity) may be associated with low macular pigment optical density. It then suggests solutions: blue light filtering (and polarized) tinted glasses, an antiglare dashmat, and macular pigment carotenoids rich food or dietary supplements to decrease your glare sensitivity. There seems to be surprisingly little research exploring the connection between driving in the sun, glare, eye strain, and driver fatigue (Visual fatigue and the driver; 2008). But vision science has been making important advances in the understanding of glare sensitivity (photophobia), our natural protection from glare, and about possible treatments of low threshold to light brightness and glare. Disclaimer: This post was motivated by a surprising discovery that regular orange tinted glasses help me reduce glare more than dark grey polarized sunglasses when driving in the sun!? I am not a vision scientist however I am very interested in anything related to light and glare sensitivity. Disclosure: I would like you to know that I earn a commission (at no additional cost to you) if you use some of the links below to purchase a product. If you wish to support GLARminY, use the links containing text: Disclosure: commission link. You may also “donate” a small percentage of anything you might buy from Amazon by accessing amazon.com through this link (Disclosure: commission link) at any other time. Asphalt road, plastic dashboard and a windshield form a challenging setting for our visual system. In nature it could only be compared to such harsh, intensely reflective and glary environment as water. Other natural environments (fields, woods) in which our eyes evolved are much gentler on our eyes. The colors found in nature tend to reflect proportionally less blue light than grey roads and dashboards. Also, surfaces in nature are predominantly matte, i.e. anti-glare (save water and snow) and, hence, much less glary than smooth surfaced roads and dashboards. If you have more light-sensitive eyes, it is probably obvious to you that roads and dashboards are bright and glary in sunlight, but nevertheless; A seemingly unrelated study (on why mayflies fatally mistake asphalt roads for water creeks) shows that asphalt roads and plastic dashboards are essentially smooth surfaces that reflects light from the Sun very much like water – see table below (Why do mayflies lay their eggs en masse on dry asphalt roads? Water-imitating polarized light reflected from asphalt attracts Ephemeroptera; 1998). The indirect (reflected) glare from a road or dashboard is horizontally polarized light. Unfortunately shiny polishes are often applied to dashboards making them even more reflective (brighter and glarier – perhaps comparable to a wet road in the table above?!). Terrible for glare sensitive eyes! Glare reflecting from the road, glary dashboard and veiling glare on windshield. A related problem is dashboard reflection on the windshield. This ghost image lowers the contrast of the objects beyond the windshield thus reducing visibility (see image above). Subsequently eyes strain more when driving. More reflective (glossy) dashboards cause stronger veiling glare. (Fundamental issues in automotive veiling glare; 1997. Veiling glare in car windshields; 2009. Daytime veiling glare and driver visual performance: Influence of windshield rake angle and dashboard reflectance; 1997). If you must, make sure it is a matte polish!, like the 1Z Einszett Cockpit Premium Interior Plastic Cleaner. Also, if you have your car cleaned, make sure you give precise instructions with respect to dashboard cleaning. (Recommendations collected from different auto-forums). 3. Cover your dashboard with a velvet/suede-like, dark – best black, dashmat (disclosure: commission link). Make sure to select the dashboard cover designed for your car. Black velvet-like texture on a dashboard has been known as the most effective anti-reflective and anti-glare solution used in aviation and race driving for decades. This image shows the effect of a black suede/velvet-like texture on a dashboard; Dashboard glare is reduced and veiling glare is eliminated such that vision (contrast) and visual comfort are greatly improved reducing eye strain and driver fatigue. A quick solution or if you just want to see the effect a dashmat/flocking would produce with respect to dash glare and veiling glare is to cover the dash with a black (dark) matte cloth. 4. Flocking (gluing millions of tiny fibers onto your dash to create a velvet-like texture) is another option for reducing dash glare and reflectivity ). Flocking is preferred by racers and racing enthusiasts (see images below). It requires taking the dashboard out of the car… Look for a flocking service, or if you feel like doing it yourself see these DIY Dash Flocking instructions. 5. Wear polarized sunglasses. By depolarizing the light reflected from the dashboard and the windshield, polarized sunglasses eliminate veiling glare and cut down glare from the dash and road. However, before buying polarized sunglasses, take a look at the section Tinted glasses: Mind the color! below. The right choice of lens tint/color might help you further reduce glare discomfort. Also note that accumulation of dust, dirt or haze on the front and back faces of the windshield may be another reason for reduced contrast. So it is advisable to keep your windshield clean to avoid eye strain. Glare is your worst driving comfort enemy. Glare and brightness lead to visual discomfort: photophobia or discomfort glare. It has been suggested that photophobia is a normal biological protection against potentially damaging short-wave light, i.e. blue light (Macular pigment optical density and photophobia light threshold; 2006). It is normally manifested by an instinctive desire to squint or look away from the light source (Action spectrum for photophobia; 2003). On sunny days a driver subdues the natural aversion to intense light and puts up with discomfort glare for extended periods of time. The squinting and prolonged visual discomfort caused by glare leads to eye strain. Likewise, low contrast of the viewed image (as when staring at the road through the ghost image – veiling glare – on the windshield) also strains the eye. Eye strain (asthenopia) symptoms may be general fatigue and a feeling of exhaustion, headache and tension around the eyes (Is all Asthenopia the Same? ; 2003). Hence, when driving on a sunny day, intense brightness, glare and veiling glare are likely to lead to eye strain and driver fatigue. The time to feel driver fatigue from glare and the brightness level necessary to provoke light aversive reaction varies from person to person. It appears to principally depend on individual blue light filtering/absorptive capacity of macular pigment. Driving is the sun is an intense, often lengthy, experience of glare and brightness. Moreover, in many cars one is faced with the problem of veiling glare – the ghost image on the windshield which reduces contrast. Glare and/or veiling glare lead to eye strain and driver fatigue. Within the white light spectrum our eyes are the most sensitive to blue light because of its damaging effects on vision. Blue light is intense within white sunlight and is increased by roads’ and dashboards’ highly reflectivity and grey color. High intensity sunlight, blue light in particular, causes squinting, a discomfort glare (photophobia) reaction. To reduce eye strain from driving in sunlight and driver fatigue reduce the amount of blue light reaching the photosensitive layer of your eyes. You may do so either by improving your natural blue light filter, i.e. macular pigment, or by using blue light filtering glasses. Over the long-term the anti-glare function of your macular pigment may be improved through diet. Recent research favors supplements containing meso-zeaxanthin in addition to lutein and zeaxanthin because meso-zeaxanthin is not found in normal diet and many people cannot bioconvert lutein into meso-zeaxanthin. Meso-zeaxanthin is very important because it has the highest antioxidant potential and is positioned at the center of macular pigment, protecting the portion of the macula that is subjected to most stress from light (Distribution of Lutein and Zeaxanthin Stereoisomers in the Human Retina; 1997). Vision scientists, therefore, recommend supplements containing all three macular carotenoids to achieve normal density distribution within the retina, and hence most likely normal retinal health and function. You may buy supplements containing all three macular pigment carotenoids – lutein, zeaxanthin, and meso-zeaxanthin at Amazon: US/Canada-based readers (Disclosure: commission link); UK/EU-based readers (Disclosure: commission link). Immediate solutions to macular pigment deficiency (and discomfort glare) include tinted glasses or contact lenses (that selectively filter more blue light). Solutions to veiling glare are anti-reflective dashmat or polarizing filter on your tinted glasses – polarized sunglasses. The relatively recent discovery of the variability in macular pigment optical density discussed above explains the inconclusiveness of previous studies on the effects of yellow tinted glasses on vision (The Visual Effects of Intraocular Colored Filter; 2012). A person with high macular pigment optical density is likely to find putting yet another blue light filter detrimental. Conversely, persons whose vision is sub-optimal due low blue light absorption of their macular pigment are very likely to embrace blue light filtering tinted glasses. This paragraph is meant to stop you from repeating my mistakes. Glare discomfort (photophobia) normally makes you want to just turn off all the lights and be in the dark. But the solution might be to adapt the lighting, decrease contrasts in brightness. The equivalent and erroneous reaction for outdoors (driving) is to put on sunglasses with the darkest tint. So before knowing all the theory above, I bought the darkest grey tinted polarized sunglasses I could find. I also tried other tints (amber) but they made the world look brighter!! So I immediately took them off. Unfortunately! If I’d waited a bit, for my eyes to adapt to bright and vivid colors… Today I use orange lenses (not even polarized). Every time I put them on the world seems unpleasantly brighter at first, but after a few seconds my eyes start feeling great. I am now convinced it is because they selectively block blue light. So I would encourage you to give a few minutes (hours if possible) also to brighter tints such as yellow, orange, red. The tint of the lenses determines how much of which color of light (within the light spectrum) is let into the eye. Due to the reasons discussed above, in order to avoid driver fatigue and eye strain from driving the lens should transmit little or no blue light. Mimicking macular pigment’s absorbance characteristics, tinted glasses should block blue light considerably (low blue light transmission) at least up to ~460-470nm. From that point on lenses’ light transmission should increase dramatically approaching 100% beyond ~530nm. They block all blue and also some green light (near 0% blue light transmission at least up to ~550nm). Red tinted lens overall light transmission is low (~20-25%) and its color distortion considerable. They block blue light up to ~500-540nm with ~30-70% overall light transmission. Brown lens will have a similar blue light transmission as an orange lens, but its overall light transmission is lower. It blocks the least blue light (frequencies up to ~400-470nm) but provide greatest overall light transmission (~90-96%) and the lowest color distortion. Sources: Cocoons Eyeware, Uvex (pdf: 798KB), Rosco, BPI (source of spectrogram images above), KBco, and f.luxometer. In summary when buying tinted glasses for improved driving visual comfort look for considerably lower blue light transmission than overall visual light transmission. Also, ideally the lens should block blue light at least up to ~ 460nm – peak absorbance of macular pigment. If you can, try out different tints for some time before buying. Ideally your tinted lenses should have Anti-Reflective – AR coatings on front and back side. In preventing driver fatigue and eye strain from driving having glasses with an AR coating is not a principal concern, but having AR coating on your tinted glasses will help you a lot. There is significant scientific evidence of AR coatings visual benefits: increased lens transmission, reduced surface reflections and ghost images, and decreased glare (Improved contrast sensitivity with antireflective coated lenses in the presence of glare; 1981. Increased visual field area with antireflective coated lenses in the presence of glare; 1981. Visual performance and patient preference: a comparison of anti-reflection coated and uncoated spectacle lenses; 1997. Comparison between anti-reflection-coated and uncoated spectacle lenses for presbyopic Highway Patrol troopers; 1999). The products below are only those where information with respect to their blue light filtering capacity is available on the internet. Tinted protective eyewear is a relatively cheap (under $10) and durable solution that may filter up to 100% of blue light. You may buy Uvex S1933X Skyper SCT-Orange Safety Eyewear from Amazon (Disclosure: commission link) – note Customer reviews – or eBay (no commission link). I own these and use them whenever I drive. They are great. Uvex S3522 Genesis X2 Safety Eyewear Amber Lens is an option if you would like very good general light transmission and sharper image due to reasonable blue light filtering capacity. You may purchase Uvex S3522 Genesis X2 Amber Lens Safety Eyewear from Amazon(Disclosure: commission link) or eBay (no commission link). UVEX amber lens is available in various frame designs. If you would like to see other options use the above links search UVEX AMBER LENS. You may purchase 3M Yellow-Amber Lens Safety Glasses from Amazon (Disclosure: commission link) or eBay (no commission link). 3M Yellow-Amber lens is available in different frame stiles. If you would like to find an alternative to the one displayed above use the above links to go to your favorite store and search 3M YELLOW-AMBER LENS SAFETY GLASSES. GLARminŸ Tester may also be used as an alternative. This product was introduced to help people test blue light filters that block different proportions of blue light. (Since its introduction I’ve also been using the Tester for driving – either on their own, or over my polarized sunglasses, when the light intensity is still unbearable). Everything about the Tester, including spectral transmission data for the eight filters and purchasing information, may be found in this post. BluBlockers offer various designs. To filter blue light the lens should be orange-ish. Since BluBlockers are marketed as sunglasses they are characterized by relatively low overall light transmission. You may purchase BluBlocker sunglasses from Amazon (Disclosure: commission link), eBay (no commission link) or directly from BluBlocker (no commission link) where you can also view all their models. LowBlueLights.com is another company that offers various designs of blue light filtering glasses. LowBlueLights lenses offer the highest overall light transmission at 100% blue light filtering capacity! You may only purchase blue light filtering glasses directly from LowBlueLights.com (no commission link). LowBlueLights.com sells four models of fitovers (no commission link) with the same blue light filtering characteristics as the above mentioned glasses. You may buy Uvex Fit Over Orange Safety Eyewear from Amazon (Disclosure: commission link) or eBay (no commission link). You may buy these Cocoons fitovers with yellow (lemon) lens of various shapes and sizes (see sizing guide) from Amazon (Disclosure: commission link), eBay (no commission link) or Cocoonseyeware (no commission link). Cocoons fitovers are available also with orange lens (blue light filtered 100% up to 520nm and overall light transmission 34%) – go to your favorite store through the links above and search: COCOONS LOW VISION FITOVERS ORANGE. Your best choice for driving in the sun might be to use tinted clip-ons (flip ups) or fitovers. If your glare sensitivity is moderate you might try blue light filtering prescriptive eyeglasses with tinted lenses. Clear prescription blue light filtering glasses are less suitable for sunlight driving because they filter/deflect only ~ 10-35% of blue light (see images below). Depending on how blue light sensitive you are, this may not be enough. Remember that a healthy macular pigment absorbes over 80% of blue light. Gunnars Prescription Rx (amber lenses) are available through Gunnar Optiks website (commission link). You may choose from a wide variety of frame styles. If you wear prescription glasses for driving clip-on flip-up lenses might be your best option to reduce glare. You may buy orange Cocoons SideKick clip-on flip ups in three sizes (M, L, XL – see sizing guide) from Amazon (Disclosure: commission link), eBay (no commission link) or from Cocoons directly (no commission link). You may buy yellow Cocoons SideKick clip-on flip ups in three sizes (M, L, XL – see sizing guide) from Amazon (Disclosure: commission link), eBay (no commission link), or from Cocoons directly (no commission link). Cocoons fitovers with orange lens are very suitable for driving in sunlight. They absorb all blue light, and have very low overall light transmission. You may be able to solve your driver fatigue and eye strain from driving with polarized sunglasses alone. Polarized sunglasses (lenses) depolarize horizontally polarized lightPolarized sunglasses (lenses) depolarize horizontally polarized light , i.e. reduce significantly the indirect (reflected) glare from the road, dashboard and windshield (veiling glare) as shown in the images below. Images source. Left: no glasses (note reflected glare from the road, dashboard, and also veiling glare – ghost image – on the dashboard). Middle: non-polarized sunglasses. Left: polarized sunglasses – most glare is!. Polarizing efficiency is important because it cuts down reflected glare (and veiling glare). Polarizing efficiency is lower with lighter tints and greater with darker tints: Yellow ~10%, Orange ~70%, Red ~75%, Melanin ~85%, Brown ~92%, Grey ~98%. Blue light absorption (filtering/blocking) is principally a property of a lens’ tint. (In some cases a mirror coating, often blue, may achieve a similar effect by deflecting some proportion of blue light such that it does not pass through the lens and into the eyes). Most sunglasses filter blue light, but some lens tints filter more blue light than other visible wavelengths (green, yellow, orange or red). The tints that absorb proportionally more blue light are Yellow, Orange, Red, and their shades – Brown, Melanin, Amber, Copper. Source: KBco (Essilor). Note that Amber/Melanin lens lets through 5 times less blue light (3%) than visual light (15%). By far the greatest ratio between light transmission and blue light transmission. Such a high ration is what you want if you want to reduce eye strain from driving in sunlight and driver fatigue. 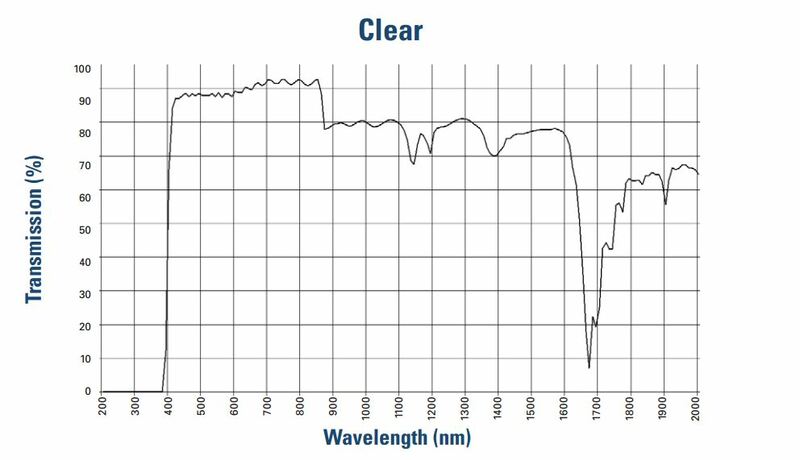 Polarizing efficiency and (blue) light transmission/absorption data sources: Laramy-K Optical, KBco (Essilor), and Polaroid. Due to blue light’s accentuated effect on discomfort glare/photophobia you should put considerable weight to lens’ blue light filtering efficiency, particularly if you have glare sensitive eyes. For example, when driving on a sunny day I feel more comfortable wearing non-polarized orange tinted glasses (less than 2% blue light transmission and 45% visual light transmission) than dark grey polarized sunglasses (~98% polarizing efficiency and equal visual light transmission and blue light transmission; ~25%). Remember that the darkest tint may not necessarily be your best option. Look for lenses with (much) higher overall visual light transmission than blue light transmission (Rubby-dark red, Sunflower-yellow, Amber/Melanin, and Sunset-orange in the image above). If you opt for orange or yellow polarized sunglasses and your problem with veiling glare persists (due to lower polarizing efficiency) you can still remove it with a black dashmat (as suggested above). Below there is a list of polarized sunglasses for which some information could be found. Unfortunately graphs with transmission curves are very infrequent. If you are a vendor of a product that should be on this list but it is not, please do “complain” in the comments or through contact form. Please, provide spectral transmission data! I’d love to consider adding your product!. BluBlocker offers blue light filtering (labeled BluBlocker) polarized sunglasses . You may purchase BluBlocker polarized sunglasses from Amazon (Disclosure: commission link) or directly from BluBlocker (no commission link) . Edge safety glasses, polarized yellow lens. You may purchase Edge yellow polarized safety glasses from Amazon (Disclosure: commission link) or eBay (no commission link). Edge safety glasses, polarized copper lens. Eagle Eyes’ polarized sunglasses were designed to block near 100% of blue light below 500nm. Consider Trilenium®10 Polarized lens because of its Anti-Reflective (AR) coating. You may purchase Eagle Eyes polarized sunglasses from Amazon (Disclosure: commission link), eBay (no commission link), or Eagle Eyes (no commission link). Dioptics’ copper/driving tint polarized sunglasses were designed to block blue light. You may purchase Dioptics’ polarized sunglasses from Dioptics (no commission link) . Serengeti sunglasses principally have two audiences in mind: drivers and pilots. Their considerable offering of styles is concentrated around brownish tints that selectively filter most blue light. Serengeti lenses are photocromatic – they adapt to light. Brighter conditions darken the lens based on more intense UV radiation. This means that inside a car (UV light is blocked by the windshield and windows) the lenses will tend to be in their lighter state. You may purchase Serengeti polarized sunglasses from Amazon (Disclosure: commission link) , eBay (no commission link), or Serengeti (no commission link). What about the most popular sunglasses brands; Oakley, Ray-Ban, or Maui Jim? For some reason blue light filtering capacity data for the more popular sunglasses brands is not readily available on-line. Nevertheless, it might make sense to single out some of their lenses that reduce glare discomfort by filtering selectively more blue light. Shop Ray-Bans on Amazon (Disclosure: commission link), eBay (no commission link), or Ray-Ban online shop (no commission link). Oakley. Consider their brown based lens tints as the most appropriate for driving in sunlight: Bronze Polarized, Fire Iridium Polarized, Gold Iridium Polarized, Shallow Blue Polarized, and Tungsten Iridium Polarized. You may purchase Oakley polarized sunglasses from Amazon (Disclosure: commission link), eBay (no commission link), and Oakley (no commission link). If interested in a specific tint, click on the corresponding image above to view selection on Amazon. Maui Jim HCL Bronze and Maui Rose appear to be the most appropriate to relieve eye strain from driving in sunlight. You may purchase Maui Jim polarized sunglasses from Amazon (Disclosure: commission link), eBay (no commission link), and Maui Jim (no commission link). Cocoons offers fitovers and a clipon with polarized yellow lens that absorbs near 100% of blue light up to ~470nm (see yellow line in the graph below). You may purchase Cocoons polarized fitovers and flipups from Amazon (Disclosure: commission link) , eBay (no commission link), or directly from Cocoons Clips or Cocoons Eyewear (no commission links). You may purchase BluBlocker polarized spring clipon at BluBlocker (no commission link) . The story of a “sunny Sunday trip” and driver fatigue had been my story. To combat eye strain from driving I started with polarized sunglasses a few years ago (see The benefits of polarized sunglasses). Later, I also used a dashboard cover and later a dashmat. Next on an intensly sunny day, I put orange tinted glasses on top of my grey polarized sunglasses. Wearing the two pairs of glasses simultaneously was uncomfortable to wear but MUCH more comfortable to my eyes. Finally, having also tried just the orange tinted glasses (with the dashmat but no polarized sunglasses) it felt just as good to the eyes and also more comfortable to wear. The epilogue: even after 5+ hours of driving on a hot, sunny summer day I felt great! Better than my wife, who’d never had problems with driver fatigue and eye strain while driving. The last two stages happened only last summer and I feel much, much more at ease driving now – my wife still can’t believe it. The story of dreading driver fatigue of a sunny Sunday trip is no longer my story. That is in the Summer, when the sun is high. However, I have been noting recently, that when the Sun is low (Winter months), only filtering out blue light is not as benefitial to the comfort of my eyes – a polarizing filter seems to provide more comfort. But, be kind to your eyes in activities other than driving! Blue light filtering (and polarized) tinted glasses and a dashmat do help prevent eye strain from driving and driver fatigue. However, I’ve noted, that I suffer less eye strain from driving and driver fatigue if I treat well my eyes also in other activities prone to eye strain. For example, I suffer from eye strain and driver fatigue less when I’d been away from computer for several days. Similarly less glare and reflections in my computer workstation result in less pain when driving. I mention computers because we tend to use digital display devices (computers, tablets, smart-phones) more and more, but the same holds for other activities that put a lot of strain on eyes. Ps: If you found this post Glare, worst driving comfort enemy: driver fatigue, eye strain causes and solutions useful, please consider LIKING, REBLOGGING, and/or SHARING it below. Thank you for all of this information, it’s been a challenge to find a fraction of this elsewhere. I’ve been experiencing what I believe to be blue light sensitivity, and I’ve had two different doctors tell me two different things. One has suggested I go with rose colored lenses, and another with Transitions* lenses. I like the idea that Transitions will change indoors, but I don’t know whether they are effective at blocking blue light, or if, like you’ve warned about, they only make things darker. Do you have any experience with those? John, hi! My only experience with transitions was over 5 years ago when I wore a pair of glasses with transition lenses. That was before I started doing research on blue light. My guess would be that transitions will also block blue light depending on their tint. Unfortunately, I haven’t seen any spectral transmission data on transitions. Best I’ve seen in terms of spectral transmission data is the percentages of blue light filtered from Serengeti (see above in this post). Their data would suggest that transitions also filter blue light depending on the tint – best bet would be brown or copper. Ask the doctors for a spectrogram. Also, you can try orange glasses from Uvex for under $10. They will tell you if your problem is blue light related. Then invest in more expensive glasses if you want. I tried Transitions lenses last year and found them to be useless in my car (which is where I needed them!). I think because of the car’s safety glass in the windshield and windows, not enough sunlight got through to turn them as dark as I needed. I ended up wearing clip-on sunglasses over them. Terri, thanks! Transitions tend to be activated (darkened) by UV light, which is filtered by car’s windows/windshield. Therefore in a car (or indoors) they tend to be in their unactivated mode. Below a couple of spectrograms for brown and gray transitions (source) – as expected brown ones filter more blue light. Thanks for the post! Did you check blue light clocking prescription lenses like Zenni’s “Beyond UV lenses”? I wonder how goof they are..
Mor, sorry for a late response. Unlike the yellow-tinted blue blockers commonly used as computer glasses, the clear Beyond UV blue blockers do not distort colors.. Think about it: If light of certain wavelengths within the visible light spectrum is not reaching your eyes’ photoreceptors, then your perception of the colors within the filtered range must change. If blue light doesn’t reach your eyes’ photoreceptors, than you shouldn’t be able to perceive (see) blue. Now, this is not to say that their glasses don’t filter/block any blue light. They most certainly do, but by how much, which wavelenghts, and how much more than they filter other colors? More on this here. To give a simple example. Regular grey sunglasses may filter out 85% of blue light. But they also filter 85% of all other wavelengths. Color distortion is minimal – the image you see is just dimmed. But your pupil dilates more offsetting the dimming. And the question is how much less blue light is reaching your retina, although it is true that the lens blocks 85% of blue light. On the other hand an orange lens might filters nearly all blue light up to 550nm and lets through most light above that wavelength, for an average of about 50% visual light transmission. Now you know that regardless of the state of your pupil nearly 0 blue light is getting to your eyes. This should be the reall meaning of “block blue light”, i.e. almost NO (0%) of blue light passing through the lens. Unfortunatelly the loose terminology is being cunningly (ab)used for marketing purposes. I whish more lens vendors would dare show their spectrograms. I bet the really good ones would sell more. Yea I agree. I was wondering the same thing so I asked them what % blue light is blocked, and the rep. said they didn’t have the information. I’m asking again now hoping that I’ll get a more helpful rep. who can help me find out. I’ll post here if I get an answer. Jon, it would be great if you posted whatever you’ll have found out. Funny, how people/organizations make claims for which they have no data!? Perhaps that is because any lens filters some blue light (see the spectrograms in UVEX lens technology brochure). 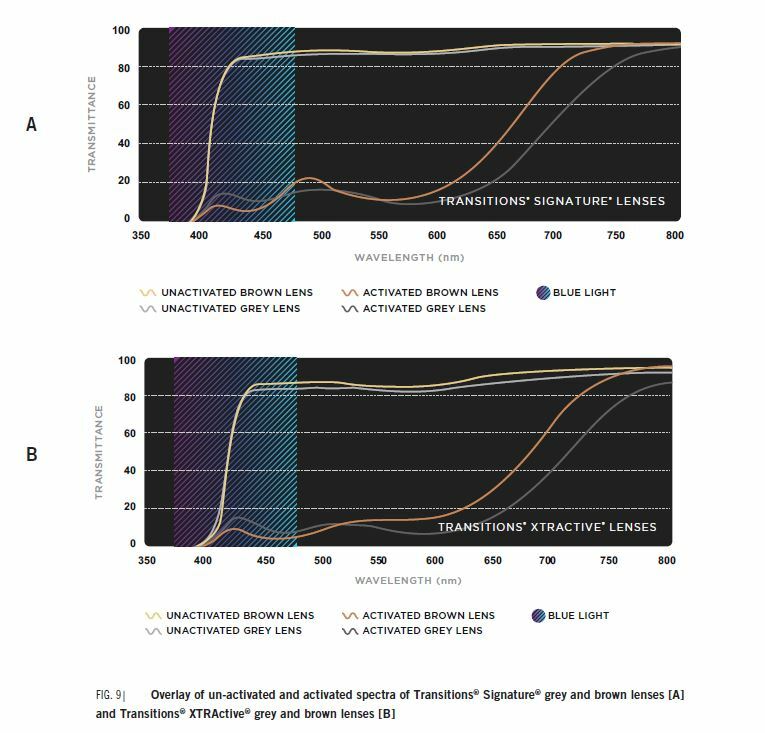 It is significant that UVEX only emphasizes blue light filtering of a lens when its blue light transmission is considerably lower than overall visual light transmission (for lenses that block much more light in the interval 400-500nm than from 500-700nm). In the case of any of the lenses that filter considerably more blue than other, longer, wavelengths (Amber, Espresso, SCT Orange, etc.) color distortion is considerable. You can shop UVEX products on Amazon (commission link).